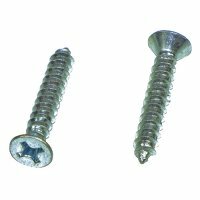 #10 - 2 Phillips Flat Head Sheet Metal Self Tapping Screws (Zinc-Plated Steel) are designed with sharp cutting threads to create threading where needed without pre-drilling a hole. Tapping screws are used mainly in sheet metal, wood, and plastic applications. The flat head allows the screw to sit flush with the surface leaving a clean, smooth finished result.